Basically, one could build their Tech, add a pole of One blocks until they reached the build limit, and then move their camera or something, and then they would be able to place an *unlimited number of blocks in the same space on their Tech. It led to the birth of @Legionite 's Ion Cannon, a Tech with like 50 Railguns occupying the same block spaces. It was fun while it lasted. ok so there is grid, visual, rigid body, collider, attachment points, animation and what else in one block? When piston is working it moves visual part and animation and rigid body but not grid, attachment points and colliders? Theres the file itself. its a .png, right out of the folder where all my techs are. Latest version. adds Y and U for parascope controls, changed forewing geometry, still 9. added more bouyancy to the bow and added a center foil to E. still needs trimming. try this. i already saved over the first model, but heres the second one. i think i pulled those previous ones from the wrong place. Not sure why that image popped up twice, but that work? Also, iv noticed that sometimes when you spawn it in, some of the Pistons spawn in extended. To reset them, just set them back to auto, let them collapse, then return them to toggle, priority closed, they should function normally. Alternatively you can open/close the set rapidly until they glitch back into proper sequence, but don't do it that way, you can crash. 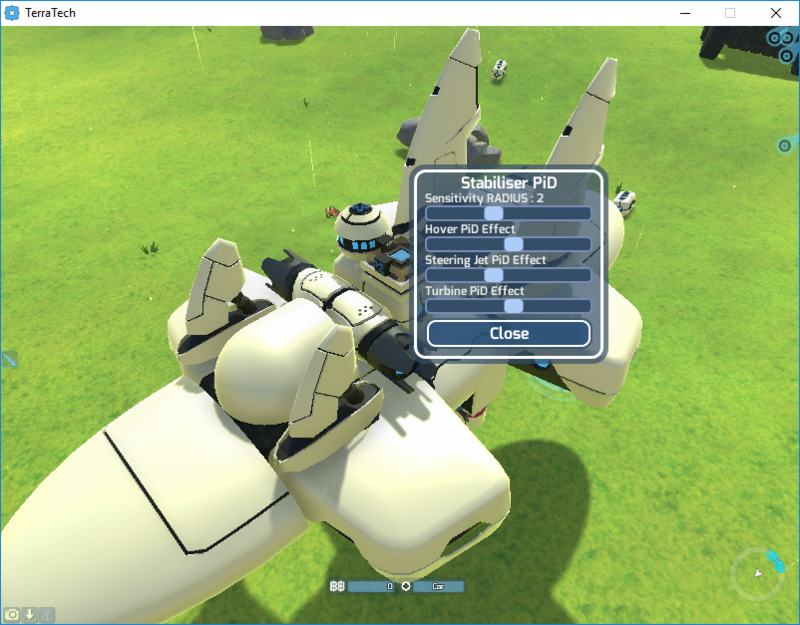 Iv found this trick works for getting the thruster arrays back in sequence without crashing, but just reset your Pistons manually, it's safer. I know some other games iv played with mods can get twitchy when you have too many mods going at once. As someone who has played Garry's Mod with 17 Gb worth of addons installed, and it taking at least 15 minutes to load the main menu, and another 5 or so to start a map, yeah, I agree. Constant Lua error messages. For reference, the base game itself is at most 4 Gb, I think. I then uninstalled all the mods, and chose only a select few, as well as a few new ones. I was basically back to over a dozen Gb of addons again. Fun times. There is graphics, colliders, grid, and APs. graphics and colliders are moved, grid and APs are not. The entire Tech is one Rigidbody. Any animated blocks will have their animated parts moved with them. ExcePt for all the deely bopper decoration blocks. The base moves with the piston, but the stick and ornament stay in their original position. Also, I'm trying to figure out how to put together a cube that can fold out into a larger cube and fold back into a smaller cube. Could you put in a control for how much weight a piston can handle or even a toggle for weight limits so we can do silly things with them? I like the weight limits, it forces you to be crafty, but there are certain projects I just can't pull off with what I got. If you look at the Duck, the Pistons on her outriggers are maxed. Put just one more block on either wing/pontoon assembally and trigger 3gets stuck closed on that side so basically I'm done with those assemballies even though I would liked to add another wing section to each that slides back, increasing the surface area of the wings, but I can't without stripping her down and re-thinking her. Again I like this, but I wish I could play with it like I can with turbines and thrusters with the mod that controls those. My new Variable Geometry Fighter. Also, forget about trying to load the Duck. the Hover Control block got replaced by the official BF Hover Controller, so its an invalid design. i'll be re-building it today. In the meantime, Check this thing out. If the first one dont work, try this. and if that fails, heres a save file attached. Geometry controls are set to 1-6. Play around with it. Trim gyro is trimmed to fully closed profile. Halt idle sliding with maximum control! CHeck out my new Cargo Bomber as well. COntrols are 1-8. 1- Bomb bay doors, 2- Lower Bomb racks, 3, Open Nose Missiles, 4- Rear Landing Gear/Liftoff Jets, 5- Lower Tail Wing/Liftoff engines, 6- Lower Wing, 7- Upper Wing, And 8- Extend Foreward Gunnery Station and Observation Deck On it's back are controls for (Aft) Sheilds, (Midship) Repair Bubbles, And (Fore) Emergency Ballest Blow (AntiGrav Controller) To rise Quickly out of combat or rapidly attain cruising height. The black strip on the fore section is access to Trim Gyros. Additionally R cycles the First person Veiws from Pilot, FOreward Observation Deck, Fore Observation Dome, Aft Observation Dome, Port Observation Dome, Starboard Observation Dome, and Bombardier's Gunnery Station. COckpits that arent controllable are Navigation and Systems, to the right and left of the cockpit, The retractable Foreward Gunnery Station, and a Dorsal and Ventral Tail Gunnery Positions. Minimum Crew of 3, Standard Crew of 8 Can cary up to 8 additional Passengers/Marines/Science Officers, Depending on it's Intended Missions. So on the note of unoccupiable Stations. You know the long BF 'Fin' Peice. It looks so much like a Cab window that i often use it as a faux Cab. Is there any way someone can Mod that block so you can veiw First Person from it? Maybe with a different, more limited feild of veiw. it would be cool if it was a cab too, but all im asking for is a FPV from it. Also, i got a Couple bugs with the pistons. When you have many pistons on a craft, particularly when they are stacked, some of the pistons dont always spawn in in their set position. This is usually an easy fix just by resetting the function of the pistons, but when all your pistons are internal, you have to rip half your tech apart just to fix a couple Pistons. Maybe a Menu that when you right click on a piston, it brings up all your Pistons. Second, You cannot attach Multiple pistons to the same group of blocks. It locks the Pistons even if both Pistons and the Module being moved are free to move. Remove one block from the center so they are now 2 seperate peices, they work fine. If i could mount them in Pairs or more i could greatly expand the complexity of my designs. Also, is it possible to program trigger sequence Algorithms? If i could hit one trigger then Pistons deploy sequentially rather than all at once i could significantly cut down on the number of Control groups that are required to operate Variable Geometry Craft. 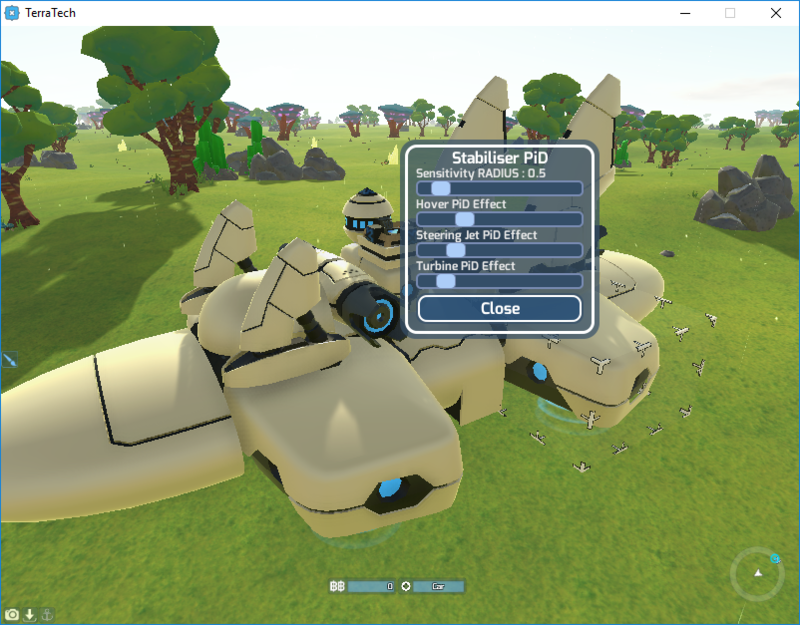 Also, again Can we put a load limit toggle on Pistons so that we can test Absurd concepts? Hey, another Grab bag of goodies with Pistons. Now, these designs are partials. Tests of concepts only. None of them are perfect or even finished, but it'll give you some ideas of what iv been working on. This is the Hypervelocity Gun. 2 is your only relevant control group. Spawn in and make sure you are anchored. you may have to lift off with the Build beam to do it, Detonate the Bolt with X, Make sure your Anti-Grav controller is turned on, then Switch back to the Main tech. Fire with Space to fire the cluster Lasers. Press 2 to enguage the Hyper Velocity Gun. For proper animation, Let the Batteries on the dummy tech charge fully before you fire the bug guns. if your timing is right, the Chargers will Feed the Cannon in time with the Rail Gun's rate of fire. Here's a failed Swing Wing Multi-Tech Design (Just the Swing Wing Mechanism). Now this one failed as the attaching hinge doesnt handle the weight of the Wing and the tech glitch apart. Im working on a fix for this, but im not ready to post it yet. so, heres a failed attempt just so you all can learn from my mistakes as well. This is a good example of the 'Sliding Piston' module i'm using to try to... well, you'll see. it's spectacular, and everyone says it cant be done. And, Because of a three file limit, Im double posting. Not my fault. Here is the Variable Geometry Fighter, The Duck, and the Cargo Bomber. The right files this time. I have all the Control groups for them listed in my posts above. I was pulling the files from the wrong folder. found the right one. And More to come. I'm working on a pair of very special projects that will make anyone second guess themselves when they say something cant be done. (One of them is without Mods) I cant say more right now, because i dont want to put my foot in my mouth and promise you something that doesnt work. Youll see, and you'll love it, i promise. So one thing i noticed is that when you have a piston extended, the origonal position of all blocks attached to it are represented as floating attach points. it wont prevent you from clipping parts, but you can clearly see where it will clip, so you can build in a way that wont clip. Now from my understanding, Hinges are impossible (According to the devs) as the hinge would not take into account open and closed positions to prevent clipping. So if the Pistons can display the origonal position of attach points while extended, could the same idea be applied to hinges? Yes they will still allow clipping, but if we keep that in mind when engineering we ought to be able to design a hinge peice that will work when used responsibly and carefully. Any chance a modder could look into hinges and hydraulic articulation? Good, you know, im glad you brought this up. I want you to take a good hard look at the Date Joined entry in your user profile. Then look at mine. You sir have in fact stolen MY username. Now I didn't really care before, but since you decided to be smart about it. you can go ahead an change yours and stop copying mine now. Thank you very much, "Mindless"
and really wrong time and place to bring it up if your concern was legitimate to begin with. that belongs in a PM, not in the middle of a conversation about working on and improving a MOD. But hey, i have no problem doling out public embarrisment to people who arent smart enough to get their facts in order before leveling unfounded public accusations. Hey, dont bark and i wont bite.